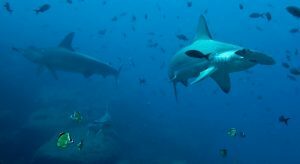 Join us at a premier big animal diving destination: Cocos Island. Located in the Pacific Ring of Fire, 300 hundred mil es off the coast of Costa Rica, “Cocos” is known for high adrenaline diving. Similar to the Galapagos and Revillagigedos, this 10 day expedition during prime season will satisfy your shark cravings. Schooling hammerheads, galapagos, silkys, white tips, silver tips, and hopefully tigers and whale sharks! 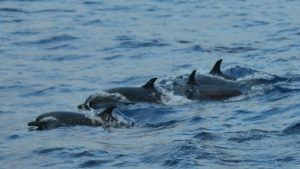 Add to that: dolphins, baitballs, schooling jacks, turtles, big rays, and large pelagic fish and you have a recipe for incredible diving. 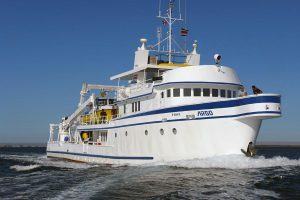 The 130 ft. luxury liveaboard M/V Argo is the premier dive boat in the region. With a limited load of only 9 staterooms, the Argo offers smaller dive groups, more intimate service, and less crowded dinghy rides. Incredible animal encounters, large cabins, excellent food, free nitrox, free beer (!) and the option of a deep sea submersible ride and you have a recipe for an amazing dive trip. “Cocos Island is also home to at least 27 endemic fish species including the exotic rosy-lipped batfish. The terrestrial life at Cocos also exhibits a high number of endemic species. The island is home to 70 of the 235 identified vascular plant species in the world, some 25 species of moss, 27 species of liverwort and 85 species of fungus. There are upwards of 87 bird species, including the famous Cocos Island cuckoo, finch and flycatcher. There are 362 species of insects, of which 64 are endemic. Two native reptiles are found only on the Island. RESERVATIONS: A minimum $1800 deposit is required to reserve your space on this trip. Second payment of $3000 is due 9 months prior to the trip (December 31 2018). Final payment is due 4 months prior to the trip (April 1 2019). Airfare booked by Worldwide Diving Adventures must be paid upon flight reservation. Cancellations are subject to a $300 processing fee. Price is based on double occupancy. Reservations and payments will be forfeited if full payment is not received according to the schedule. No refunds can be made after February 1, 2019.
Credit cards (VISA & MC) may be used with a 3.5% transaction fee, or… send your deposit today by check or Venmo and avoid fee. INSURANCE: Emergency dive evacuation insurance is required on this trip. Most divers-in-the-know use Divers Alert Network (DAN) Dive Accident Insurance. We also strongly encourage purchasing DAN Travel Insurance. They offer competitive rates, and your money goes to a fantastic program. DAN has helped many of our guests (including ourselves) recoup money for medical expenses and lost dives from even minor maladies; unfortunately, we have also seen a few divers need helicopter rides to a decompression chamber. Insurance gives you the ability to listen to symptoms which otherwise you might ignore. Contact Dan (danchua@finstad.com) for more information. *Price does not include $490 park fee, $100 transfer fee, airfare, hotels, or potential fuel surcharge. Price is subject to change.